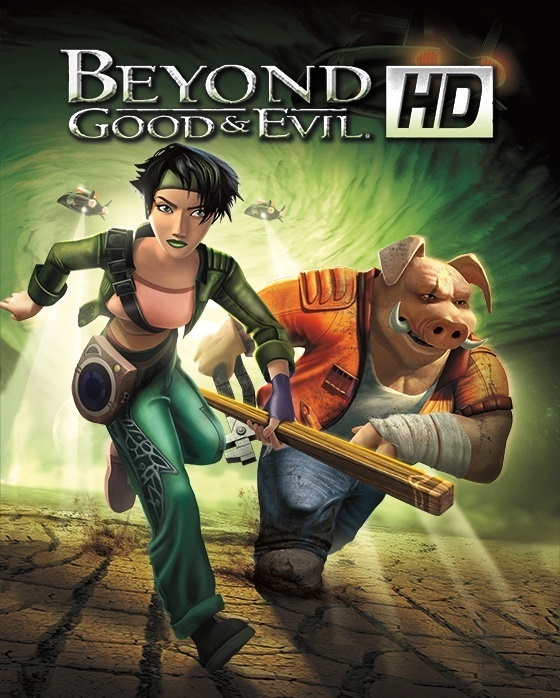 I can't quite put my finger on it, but Beyond Good & Evil is probably one of my favourite videogames of all time. While it may not do all it of it's smaller, sometimes quirky, but hugely entertaining gameplay elements perfectly, crossing numerous genres along the way, it's the whole package of a game that delivers a fantastic result. It's all these ideas, clearly inspired by popular games through the years, combined with a great story, colourful characters and incredible artstyle set in a beautiful coastal area that blends into a unforgettable experience. Extremely few games truly master the art of combining gameplay styles and crossing genres in such a manner, and BG&E stands out as one of the top at it's class doing so. 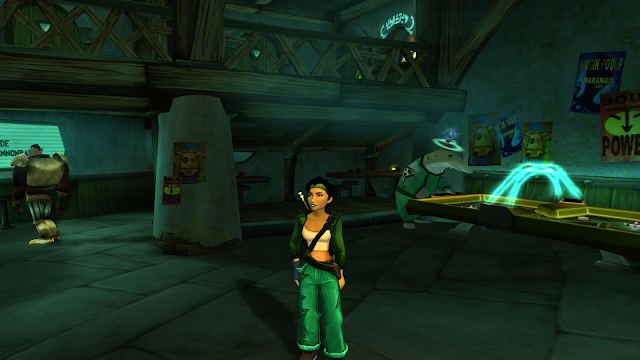 BG&E, Ubisoft's sleeper hit of 2003, was released on Gamecube, PlayStation 2 and PC simultaneously. The latter two were the ones I played and loved back in their day. Although it wasn't initially the hit the company had wished for, selling disapointgly under a million copies, it was directed by the french director behind the critically acclaimed Rayman series, Michel Ancel. Sales aside, it became a cult hit among gamers and fondly remembered. The strong female lead, Jade, became an iconic gaming figure even without huge sales behind her or being a typical sexualized character like the far more famous Lara Croft. It's cult popularity paved way for a HD remaster in 2011 on the Xbox 360 and PlayStation 3, speculated to be in preparation for a sequel that was teased around the time of it's release. A sequel which has turned out to be on indefinite hold until very recently, going into a pre-production stage. The HD remaster runs in 1080p and 60 fps to boot, a real nice visual treat for last-gen consoles, and is backwards compatible on the Xbox One. The latter giving me a perfect excuse to replay it again lately and write down some thoughts! 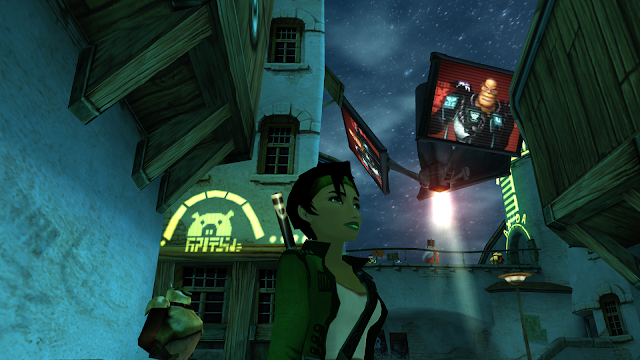 BG&E is a 3D action adventure, basing itself on a sandbox styled open world, though with a fairly small free roaming layout of a seaside city. 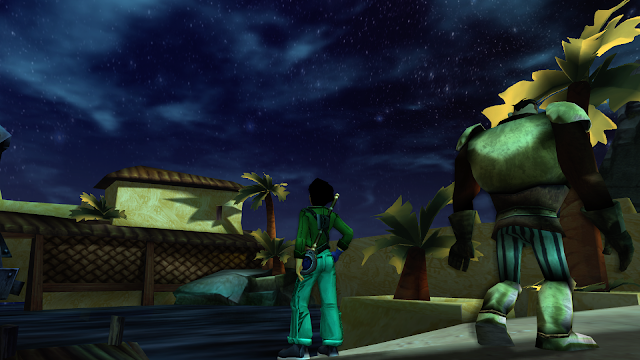 The player controls Jade, a green clothed female photographer with dark and short hair whom owns a lighthouse for orphan children. The lighthouse is ran by herself and a pig called Pey'j, whom is an inventor of sorts. I simply adore the setting of this lighthouse, perfectly captivating a soothing and beautiful seaside location on a little island. 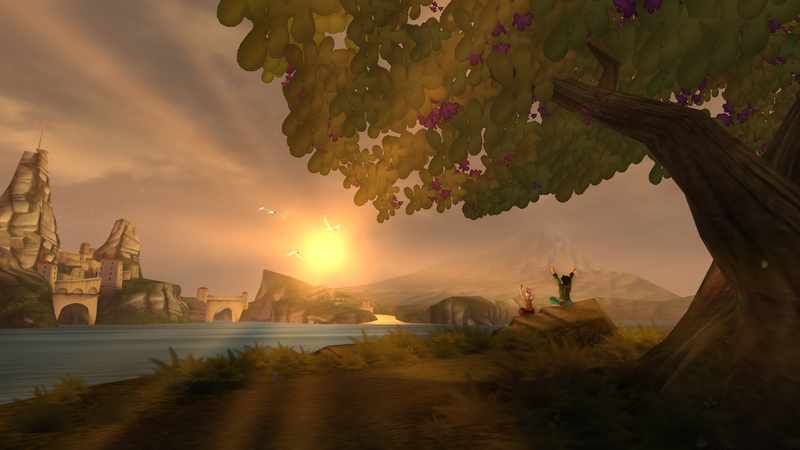 The sunset, which Jade admires in a yoga-like position in the intro, while looking out towards the sea with the wind blowing gently in a huge tree on a cliff with seagulls flying above really sets a unique mood. It's perhaps one of the most memorable and beautiful openings visually for me through the years of gaming. The tranquillity quickly ends here though at the tale's beginning, as an alien race called the DomZ attacks the lighthouse. The DomZ are notorious for abducting people. Repelling the attack with a neat combat tutorial, Jade and Pey'j head out in the small world of the Hillys to explore what is really going on. They learn that the Alpha Sections, an army division of sorts mean to protect he civilians against the DomZ, control the city and warn people of a resistance group called the Iris Network. 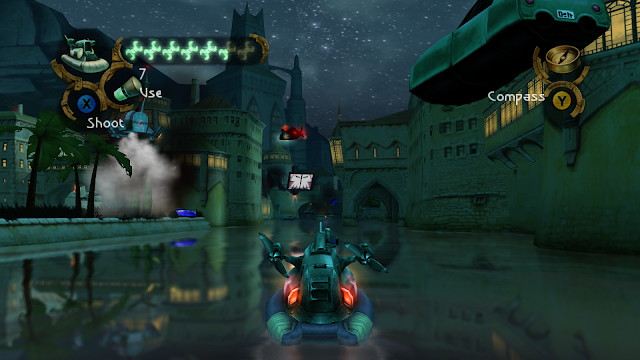 Leaving lighthouse island introduces the player to the main means of transportation through the open world parts of the game; a hovercraft boat. This hovercraft will take you to shops, a small city and the main locations throughout the story. It's neat way of traversing and the distances, never feeling too far away that they become bothersome. You can even participate in some racing with the hovercraft! 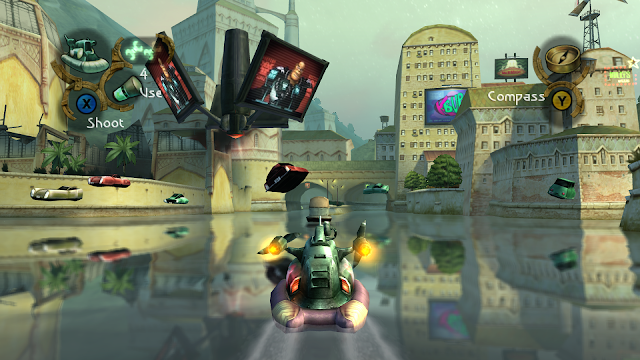 The main part of the game is controlled on foot as Jade in third person. Puzzle solving and taking photographic evidence of either wildlife (every creature in the game can be documented through photos) or spying on the DomZ along the way. This game seemed to arrive in a time where photographing in game was kind of a thing, remember Tecmo's Fatal Frame/Project Zero series for instance?! However it's done neatly in BG&E and never forces it upon the player, though I would strongly recommend using it to gain more pearls easily. Engaging in combat will lock you to one enemy at the time, letting you circle them. Either deflecting and defending yourself or giving some fatal blows with your fighting stick. Fighting flows nicely and feels just right, without ever throwing the player into never ending fights with hundreds of enemies. Mostly though, the game awards the player for a stealthy approach, in fact it's often required. It's one of the few stealth games that I really liked, perhaps as it was fairly easy to understand what you had done wrong and how you were spotted. Each stealth area needs to be memorized, but doing it wrong gives you an opputunity to escape and renter the room and try again. Without dying all the time it feels more rewarding to retry, perfecting your stealthy run through guarded rooms. I really appreciate how BG&E cleverly disguises a deep story as a colourful one from the outside. Which perhaps gives people an impression that this is only a kiddies game. It shouldn't be mistaken for one though, as it's much darker than it initially it appears. The story takes some seriously unexpected turns along the way! Sure there are some downsides to BG&E, though nothing that dethrones it from being one of my favourites of all time. The controls for instance, especially how the camera works can be a bit confusing, even worse is that you cannot choose inverted controls. Luckily playing this on the Xbox One, I could invert the controls outside of the actual game. The rather short ending too, leaves us with a longing to see more of how things went for everyone in the story. There's even a cliffhanger at the end of the credits, which I'll say is optional to view, especially since a sequel has been so uncertain through the years. BG&E stands out as a game that succeeds at a lot of ideas and actually making them all work in such a way that it keeps entertaining you throughout. The mix of an unexpected deep and dark story, fun and easy to grasp gameplay makes it an all time classic for me. I get that it doesn't revolutionise any genres or pushes any limits of new gameplay elements, visual boundaries or incredible storytelling, but the combination of doing everything it offers so well impresses me still. The visuals have beautiful artstyle that hold up surprisingly well so many years after release and render favourably in a far higher resolution. It's about videogaming returning to what gaming is about; enjoyable gameplay and being pulled into a fantasy world that tells a story you'll most likely remember for years to come. A little short on length and content, and with it's awkward camera at times robs it of a full score, but make no mistake; you really need to play this game once in your life. It's one of the best experiences made, a real classic. Or is that a cult classic considering sales? !